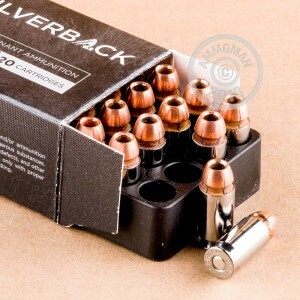 These lead-free .45 ACP rounds are a great option for self-defense that is designed using the latest in modern ammo production technology. Each cartridge is constructed using a reloadable brass casing that is nickel-plated for corrosion resistance as well as slick, reliable cycling. 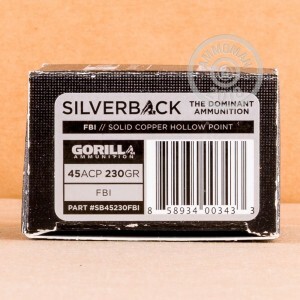 As part of Gorilla's "Silverback" self-defense line, these cases are armed with clean-sparking Boxer primers and crowned with 230-grain solid copper hollow point (SCHP) projectiles. The bullets are in line with standard .45 auto cartridge intended for training and will match the majority of practice ammo. Gorilla designs their SCHP projectile with over-expansion in mind. When the bullet strikes a target, it will experience massive, star-like expansion which creates a very large wound cavity during entry. As a result, the rounds will deliver optimum energy to a threat resulting in a more immediate drop while resisting over-penetration which could be a danger to others. Gorilla ammunition is manufactured in Florida and undergoes a stringent inspection process before shipping. The SCHP projectiles are made on a swiss CNC lathe and produce zero lead particles in the air.